Catholicos-Patriarch Ilia II served the liturgy at Holy Trinity cathedral on his 76th birthday on January 4. In his sermon His Holiness discussed the problem of the territorial integrity of Georgia, stressing that conflict is temporary and can be settled. The Catholicos-Patriarch of All Georgia asked the parish to pray that the country overcomes the serious danger facing it. Those attending the special service congratulated the Patriarch of All Georgia on his birthday and wished all the best to their spiritual leader. Zurab Abashidze, a political science expert and former Ambassador of Georgia to NATO and Russia, emphasized the importance of Catholicos-Patriarch Ilia II in Georgian history. “In an epoch of the historical elucidation of the future of Georgia we have a spiritual father and leader with strong authority which needs to be understood by us very carefully. I have experienced the authority he wields in the Russian Federation as well as in European countries. It is a great benefit to have such a Catholicos-Patriarch, whose prayers protect us from evil and will finally pave for us the way to peace. His Holiness and Beatitude always mentions in his prays that Georgia should be united and if we listen to him and walk in his footsteps we will find the right way,” Abashidze told The Messenger. Musician Tamriko Chokhonelidze noted that the Catholicos-Patriarch has been a gift of God to Georgian nation as a symbol of hope. She stated that His Holiness and Beatitude takes care of the whole Church. “Ilia II often holds receptions for young artists to help them showcase their talents to the public. Guests attending such an event become familiar with the talented youngsters’ work. He gives an example of how to notice a gift in a person. “The Catholicos-Patriarch writes hymns which the Choir of Sameba Cathedral sings with great happiness and pleasure. I would like to wish good health to His Holiness and Beatitude from the whole of Georgia,” she stated. Nineli Chankvetadze, a famous Georgian actress, admits that the Patriarch of All Georgia is her number one authority and she always listens to his Sunday sermons, trying to catch his every phrase and act on the advice he gives the Georgian nation. “Everything the Patriarch tells us is important for Georgians as a whole,” Chankvetadze stated. Patriarch Ilia was born Irakli Shiolashvili in Vladikavkaz in 1933. The son of Giorgi Ghudushauri-Shiolashvili and Natalia Kobaidze, the Patriarch is a member of an influential eastern Georgian mountainous family linked to the former royal dynasty of the Bagrationi. After graduating from the 22nd secondary school in Vladikavkaz in 1952, the future Patriarch entered the Moscow clerical seminary from which he emerged with a first class diploma, beginning his ministry as a priest at Batumi Cathedral Church. On August 26, 1963 Father Ilia was chosen as Bishop of Batumi and Shemokmedi and appointed a Patriarchal Vicar. From 1963 to 1972 he was the first Rector of the Mtskheta Theological Seminary, the only clerical school in Georgia at that time. In 1967 he was also consecrated as the Bishop of Tskhumi and Abkhazeti. He was elevated to the rank of Metropolitan in 1969. 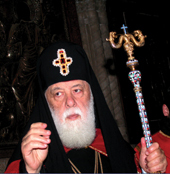 On December 23, 1977, Metropolitan Ilia was chosen the new primate of the Georgian Orthodox Church on the death of Catholicos-Patriarch David V. Ilia II was enthroned on December 25, 1977 in Svetitskoveli Cathedral.